We have developed a sample panel containing 30 different stained glass samples, which you can display in your store or warehouse, or sell to your own customers. The panels are constructed with sturdy zinc came, and have two wire hooks for hanging. These substantial displays virtually eliminate the problem of missing samples. 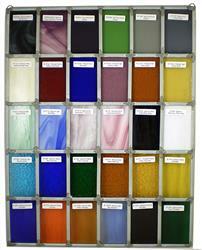 Each of the framed glass samples are clearly labeled with names and part numbers. Whether you choose to carry the glass in stock or to order from us as needed, these sample panels take the guesswork out of selecting the perfect glass. SP 305S, Spectrum White swirled with Clear, "Pearl White"